Cell phones may act as the most consistent clock in a person’s life, but wristwatches are still heavy on the market. From fitness watches that display how many steps you’ve taken in one day to watches suited for a fine-dining evening-on-the-town, there is always a watch to fit the occasion. But for now, toss aside the flashy, gold watch, because casual bands are making their way through town. From brown, black and gray leather bands to knitted nylon bands, the watchstrap is taking it down a few notches. Courtesy of rolex. A TIMELESS TIMEKEEPING ICON — THE SUBMARINER For watch aficionados, the Rolex Submariner is the epitome of a quality timepiece. The original model launched in 1953 as the archetype of the diver’s watch, exuding functionality and a sleek design. The latest styles feature a subtly redesigned Oyster case, a distinctive dial with luminescent hour markers and a solid-link Oyster bracelet. Pictured here: Rolex Oyster Perpetual Submariner 40MM, steel, $7,500. Tallahassee’s Gem Collection keeps you from going too far to find the right watch. 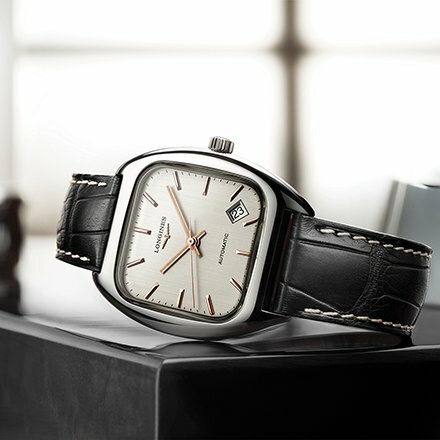 Of particular attractiveness is the Longines Heritage 1969. For those who crave the glamor of sparkling, link-band watches, Gem Collection has multiple options to choose from. The Rolex Submariner has a timeless quality that qualifies it as the perfect timepiece. It’s also very versatile. Submariners can feel free to toss this accessory on with a suit or with blue jeans. Another stainless steel watch offered at Gem Collection is the Longines HydroConquest. “You can dive in this watch, it has an automatic movement and it is very sleek and affordable,” says Collins. And the blue dial looks great with the stainless steel band. Having been in Tallahassee for 30 years, Bert Reidel Watchmaker, Inc. is a long-time local business that advertises by word of mouth. Owner and watchmaker Bert Reidel receives watches that are in need of a little TLC from all around the Southeast. Reidel is more focused on the inner workings of watches than he is on fashion trends, but he mentions that men’s watches tend to show a little more wear and tear on the band than women’s watches. This is good news for watch wearers who want to stay on trend: A leather-band watch will defeat a link watch in the durability competition. Reidel recommends that you get your watch serviced every four to five years, especially if you own a mechanical watch. Mechanical watches work off of springs to power the watch, where quartz watches run off of a battery. Like anything else, a watch requires maintenance and can hold onto a ton of its value if it is treated properly.